Last week I was telling some friends about the horrible visitation of diseases in my vegetable garden; they suggested I write a blog post on it to show another side of gardening. I focus here on the pleasures of the garden, visual and culinary; I don't want to write about every disappointment and failure. 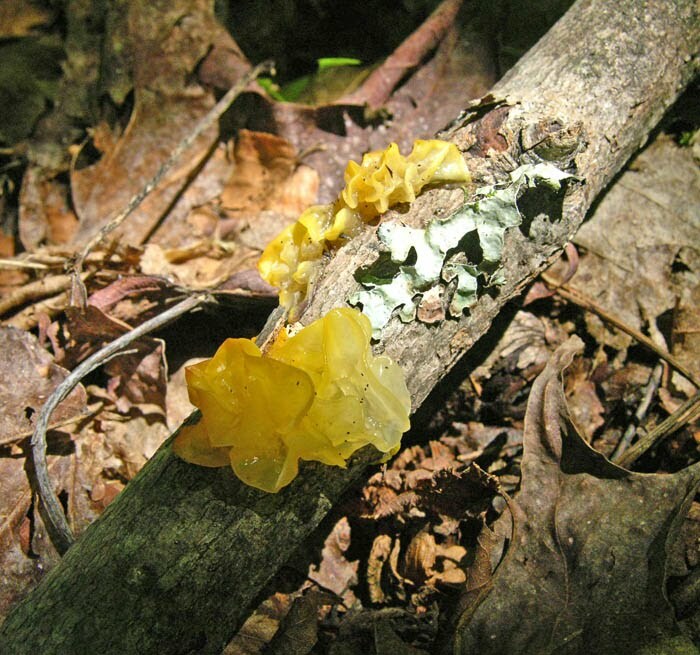 But failures are many: seeds that don't germinate, plants that don't thrive, damage by insects and woodchucks. This summer's warmth resulted in the largest and most vigorous winter squash and zucchini plants I'd ever grown. 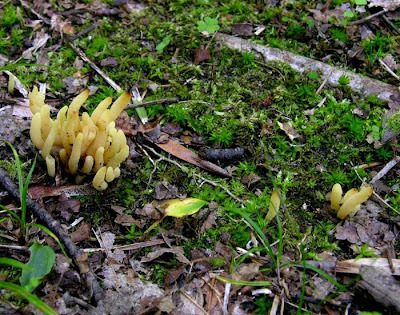 But it may be that the warmth, with a lot of rain, encouraged the active growth of mildew. You can see its powdery appearance on the pumpkin vine above, and zucchini leaf below. 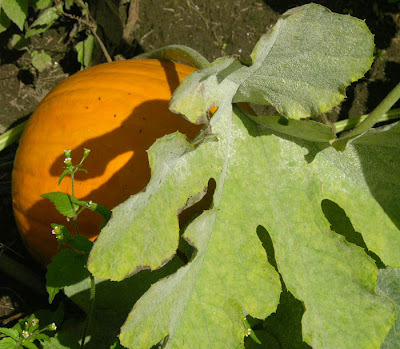 I took the photos a week ago, and now the pumpkin plant is completely dead, as are the other winter squashes, with ripening fruits without the sustenance coming from the plant. They are almost ripe, so may be edible, but won't be as sweet as they should be. 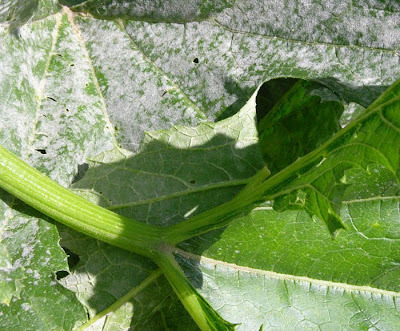 The zucchini plant, being incredibly tough, is still growing leaves and zucchini, and likely will until frost. 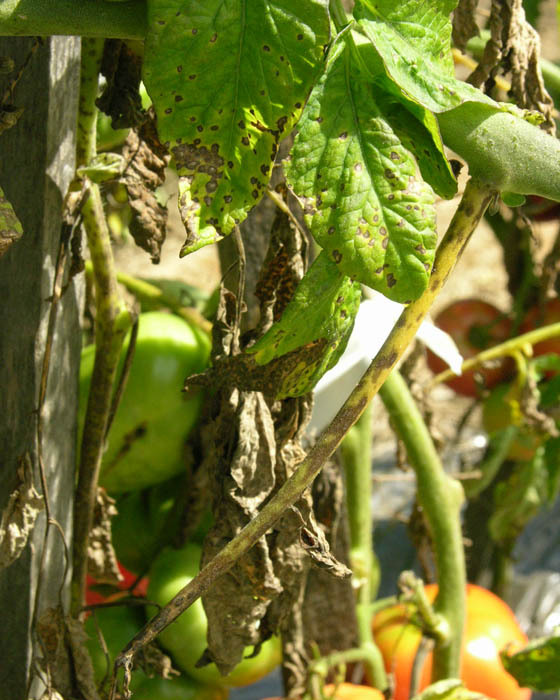 The nightshade family––tomatoes, potatoes, eggplant, though not peppers––are susceptible to blight, which spots and yellows the leaves of the plant from the bottom up, eventually killing them all. 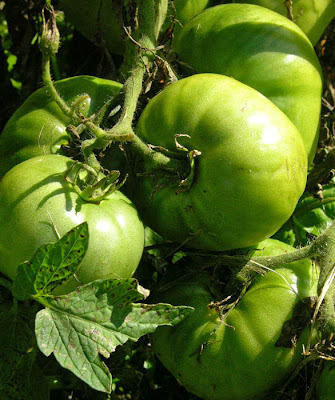 All my potato plants died back early, so will likely have smaller potatoes; the tomatoes are badly damaged, especially the determinate paste tomatoes. This leads to a smaller harvest. Next year I will be prepared: in addition to clearing off this years crop residue, I will plant tomatoes with a new system of trellising for greater air circulation. And I plan to use some organically approved sprays against diseases, something I've avoided so far. All the difficulties in the garden make me very glad I'm not doing this for a living, and make me more appreciative of the hard work and challenges facing those who do. Tomatoes are a versatile vegetable/fruit: not only are they delicious when ripe––either raw or cooked every which way––at their green, unripe stage they are tasty when fried and they make a tart jam that is one of my favorites. 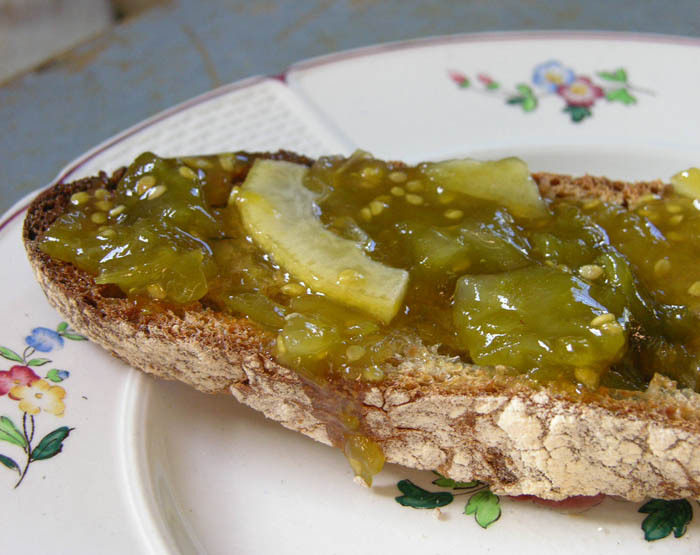 The tangy flavor of green tomato jam is similar to that of orange marmalade; this jam is not for those who love very sweet jam. For instance, I find strawberry jam too sweet, so never make it. There are three ingredients: green tomatoes, lemons and sugar. I put the recipe together from a couple of different ones I found online; some have added ginger or cinnamon, or other spices; I prefer to keep it simple. Green tomatoes after macerating with sugar for 20 hours. 3 lemons. I prefer to use organic lemons for this recipe if I can find them. I would suggest tasting the lemons to see how sour they are. This year's lemons were so sour that the jam is a little more tart than I like; if I'd realized, I would have used only two. Layer tomatoes and sugar in a non-reactive bowl. Macerate for 20 to 24 hours in the refrigerator, stirring 2 or 3 times. Put tomato-sugar mixture into a large pot (I use stainless). 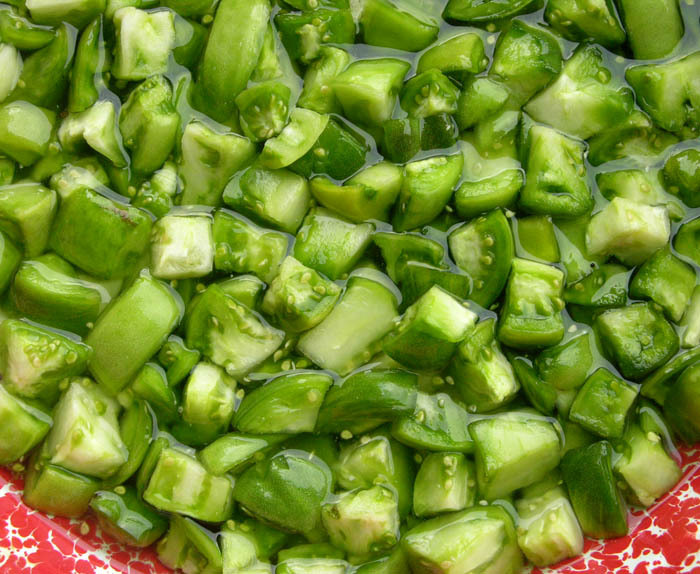 Bring to a boil, then cook at a lively simmer for one hour. Skim off any scum that may appear. Stir occasionally. Cut lemons in quarters lengthwise, then into thin slices. Add to the cooking jam and cook for another hour, stirring often. Put the finished jam in 1/2 pint jars and process in a boiling water bath for 15 minutes. 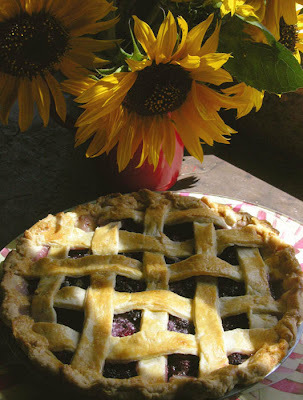 The sunflowers, singing out in brilliant color from the vegetable garden, are summer heat and light made into matter. The irony of their blooming is that now summer is on the wane: the days are noticeably cooler and shorter, the sun is lower and moon higher in the sky. It is as though they are giving a last grand gesture of brightness, to accompany the busy harvest season. 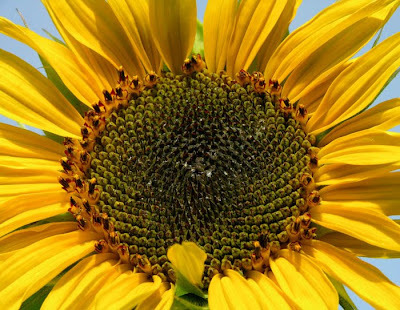 I grow a branching variety of sunflowers; rather than one large head on an enormously tall plant, these 6 or 7 foot tall plants have many 6 inch blooms, making a vivid display. I've always enjoyed seeing the development of the flower head in sunflowers, as it changes from flat to rounded form, so have photographed the procession for this post. Sunflowers are actually a composite flower, with the yellow "ray florets" around the center "disk florets". In the photo above you can see the spiral pattern of the disk florets, growing according to the golden ratio, which I wrote about in this blog post. 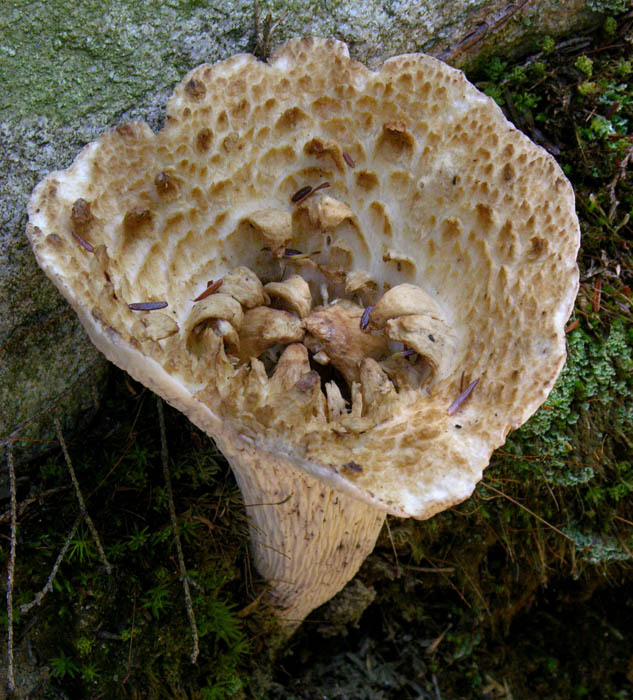 Over time the disk florets grow sexually active, from outer edge to inner. Pollen is released and flowers fertilized. 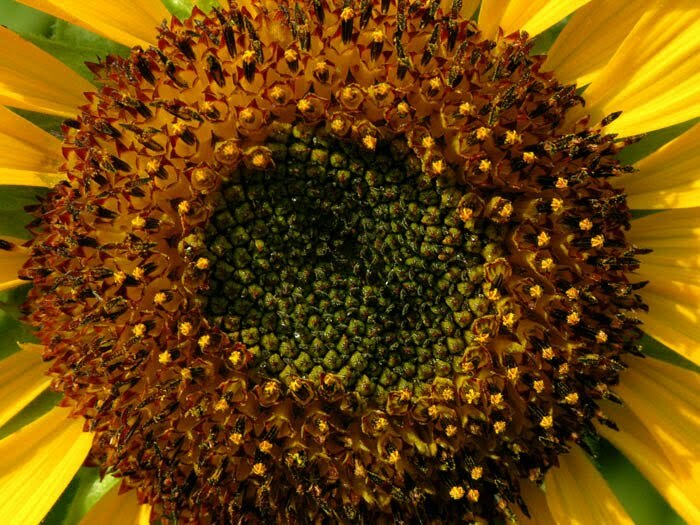 The bees are very active around sunflowers, so there isn't much extra pollen; when I cut the flowers for a vase indoors, the pollen floats down to make a golden dust on the tabletop. The flower head has become full and rounded and is now in the process of growing seed. Here you can see the not fully matured black seed. 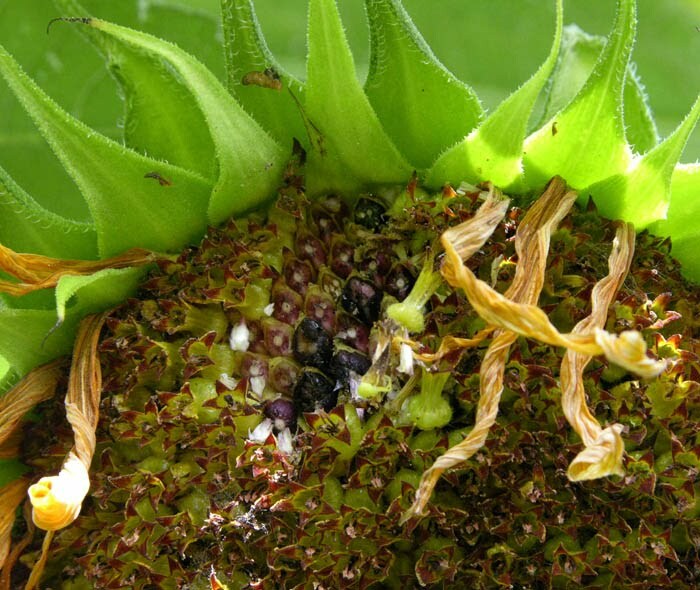 I have learned in my online research that there are numbered stages of sunflower growth; it is, after all, an important food crop. You can see a clear explanation of this here (it's a pdf). The small seeds of my garden sunflowers are food for birds, who perch on the flowers and peck away at them. 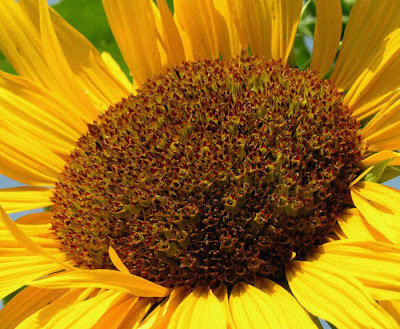 When my garden is finished for the season, I till a few of the mature sunflower heads where I would like them to grow next spring; I leave the remainder on top of the compost pile for the birds; I'm pleased to share my bounty with them. 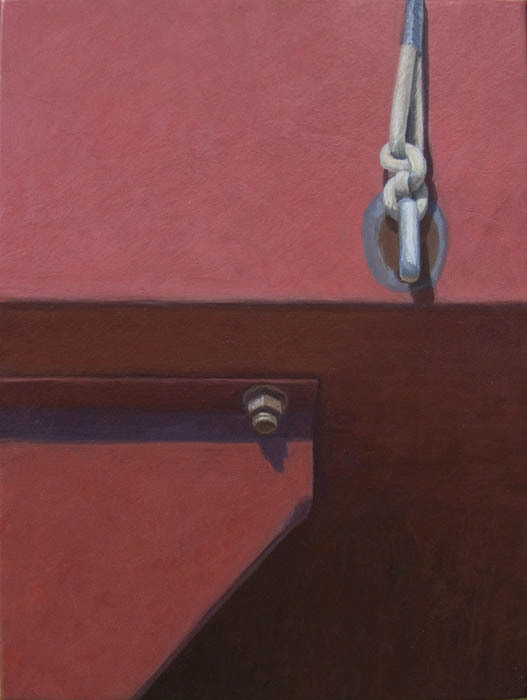 I've named this painting for the feeling of its composition––tight, simple, dramatic––and the pull of rope at the upper right. I occasionally make paintings that please me deeply, and this is one of them; something in the minimalist clarity and rich color is very satisfying. It may not resonate the same way with other eyes, but I'm always interested in whatever reactions come my way. 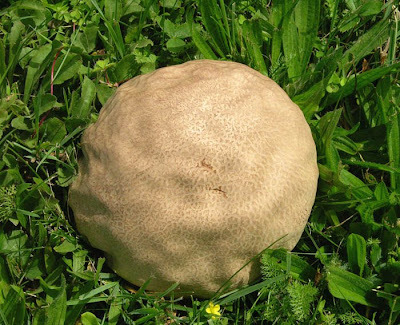 I was taking a walk before lunch down past the pond to check on the ripeness of the wild apples just beyond it; on the slope of lawn not easily seen from the house was this large puffball. What a shock it was to find it there: how could I not have noticed? I immediately began to exclaim, very loudly: oh no! oh darn! and various stronger imprecations. 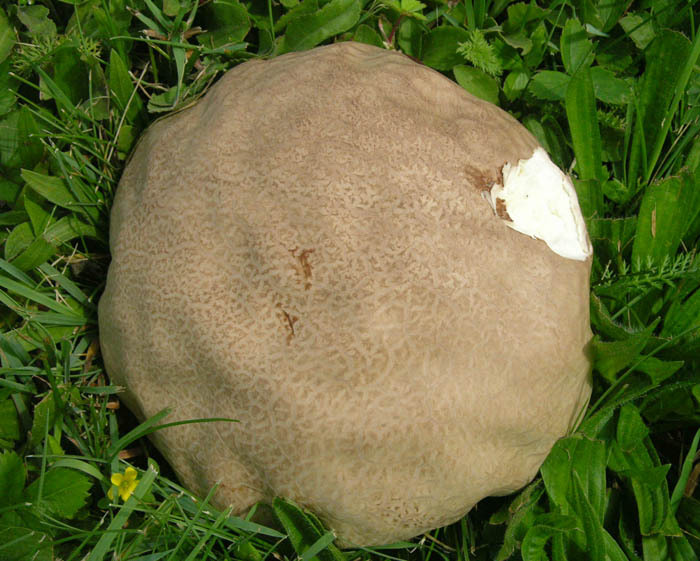 I believed I had missed the edibility window of this 6 inch mushroom because of its tan color. My frustrations were so loud that my cat Blinky (named after Blinky Palermo) came down from where he was lazing about to see what was going on. Then I pulled off a piece of the mushroom and saw that it was pure white inside. 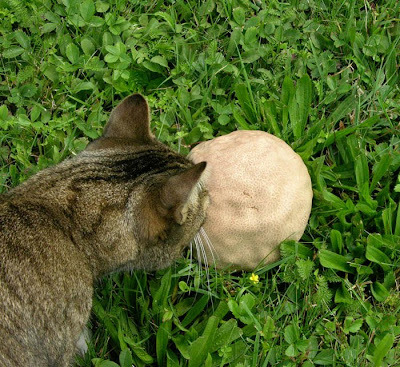 Since puffballs are choice eating, I'll save it for tomorrow morning, when I'll be making breakfast for friends. Food from the garden is a treat; wild food is a wonder. I've completed one of the two panels for the diptych Five Plus Five (to see the study for the full piece, plus wool, click here). The colors of the squares move in graduated fashion from lighter to darker, with something of a strong jump to the final square; I hope that when finished, this doesn't seem too dark. I was looking at my darkest blue today and thinking I should overdye it a little darker in order to balance the green. 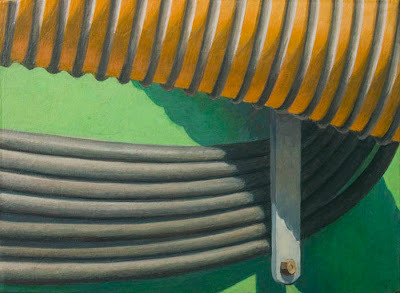 Below is a detail in which you can see the subtle shifts in color in the yellow background, and in value in the greens. The actual ruglet has more saturated color; blogger's photo uploads are very irregular: sometimes the color is too washed out, as here, and sometimes too dark, as in the photo of the wool for this piece, in the link above. We are all dependent on reproductions in so many aspects of our lives, so we can shrug, accept the limitations, and be pleased at the new audiences they allow; I do, I am. 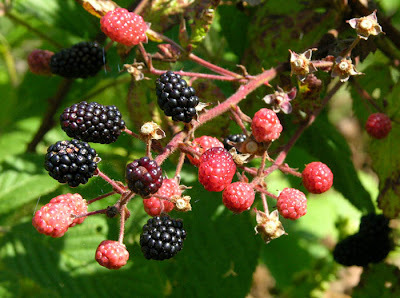 The great bounty of the late summer woods and abandoned fields is the blackberry, ripening in large jeweled trusses, colors deepening from pink to deep warm black; the fruit grows moist and plump as each little sphere of the berry matures. The plant is well protected: it is the most bramble-y of the bramble fruits, making picking something of a battle as your clothing and skin gets caught by the long spines. There's always a beautiful bunch of ripe berries just out of reach across a welter of thorny branches; attempting to collect them, my hat, shirt, hands get caught. 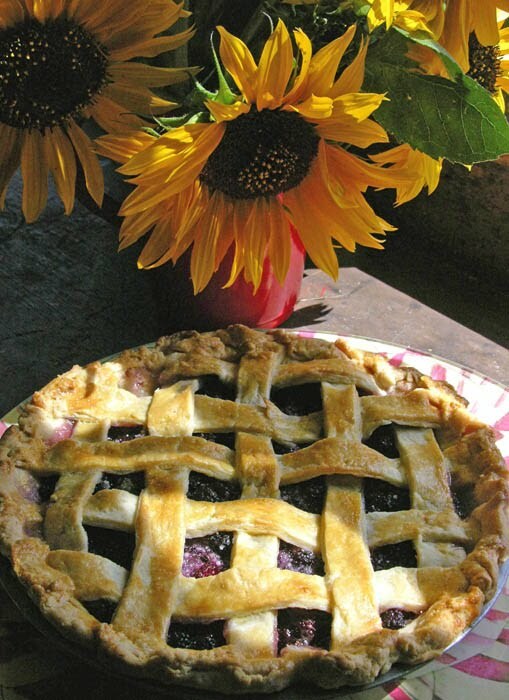 But it is certainly worth the trouble: good fresh eating in the woods, a pie for friends, batches of very tasty jam, which I cook using the same recipe as for raspberry jam. 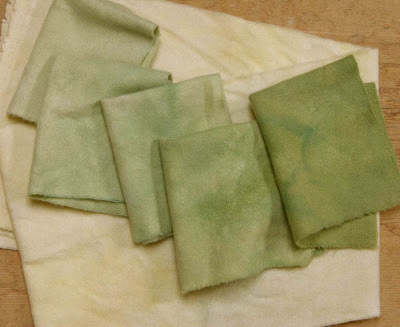 Blackberries turn out to be useful for more than food; in this post on the blog Silkenwind, we learn of using their juice for dyeing fabric, another gift from the wild. I suppose that one day I will no longer be surprised by mushrooms, but for now, they still startle me with their sometimes odd appearance. When we think 'mushroom', we usually have an image of a toadstool shaped fungus, but they grow in so many other shapes, as in the large funnel-shaped mushroom above, with its tongues curving inward, as though drawing in a victim, an animate figure in a science fiction drama. 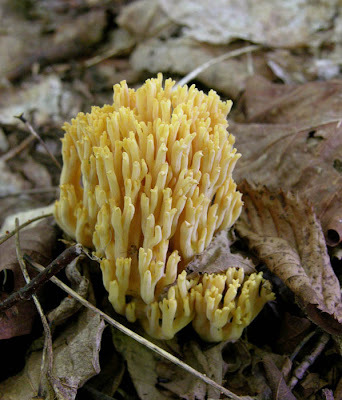 Coral shaped mushrooms aren't rare, but they are a marvel: a bit of the undersea on the forest floor. These very small tubular eruptions from the litter of the path would have been easy to miss if I hadn't had my eyes insistently gazing downward. 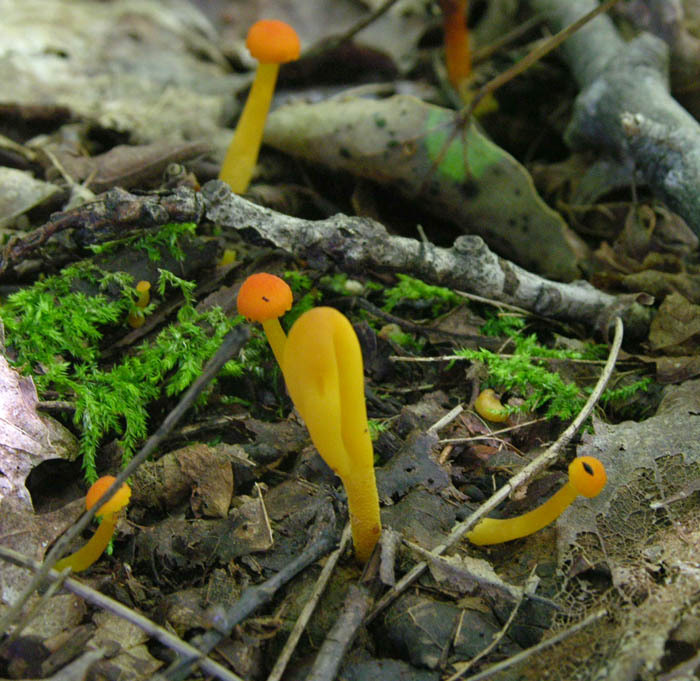 They came up in small groups, each 'finger' swaying to its own rhythm. There are some mushrooms called Jellies, and from the photo above, you can see why: a beautiful gem-like translucence. 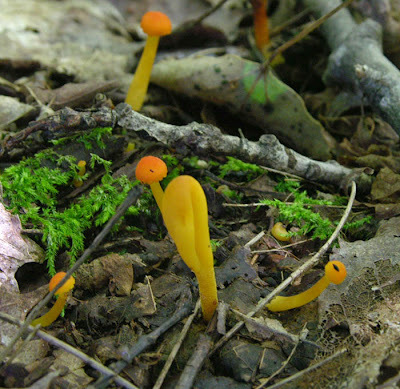 There is a mushroom pictured in my field guide that looks similar to this, and which has a magical common name: Witches' Butter. Finally, nestled among very small toadstools was this strange shaped yellow mushroom, looking like the head and neck of a graceful bird. I assume it's a member of the Earth Tongues, a perfect name for a form rising from the ground and tasting the air above. 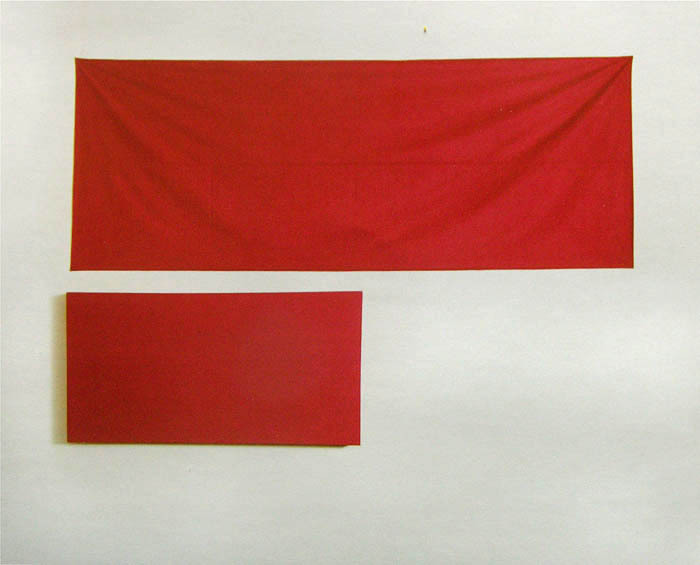 Blinky Palermo, 4 Prototypes, 1970, screenprint, 23 5/8 x 23 5/8 inches (each sheet); to read more details go to the MoMA website. 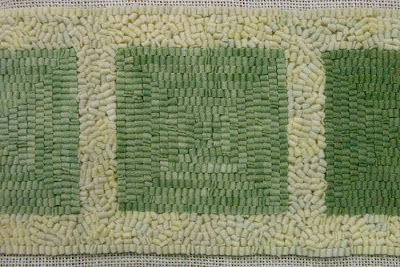 I've been thinking about Blinky Palermo recently: he was one of the artists I cited as inspiration when beginning my ruglet Up Down; his architectural works were at the back of my mind as I began Five Plus Five, my current rug hooking project. Palermo was a German artist who took the name of an American mobster and died, unfortunately, very young. I vividly remember the first time I saw his work, the print suite 4 Prototypes, at a 57th Street gallery in the mid 80s. I was thrilled by the union of minimalism with offbeat humor, evident in the irregular edges of the imperfect geometric forms. Some of Palermo's most interesting works are his fabric paintings; using readymade cotton fabrics pushed against the idea of painting as a handmade heroic effort. Speaker in a low voice wittily places what appears to be a painting below draped cloth, making us look again, think again, about what a stretched canvas is. 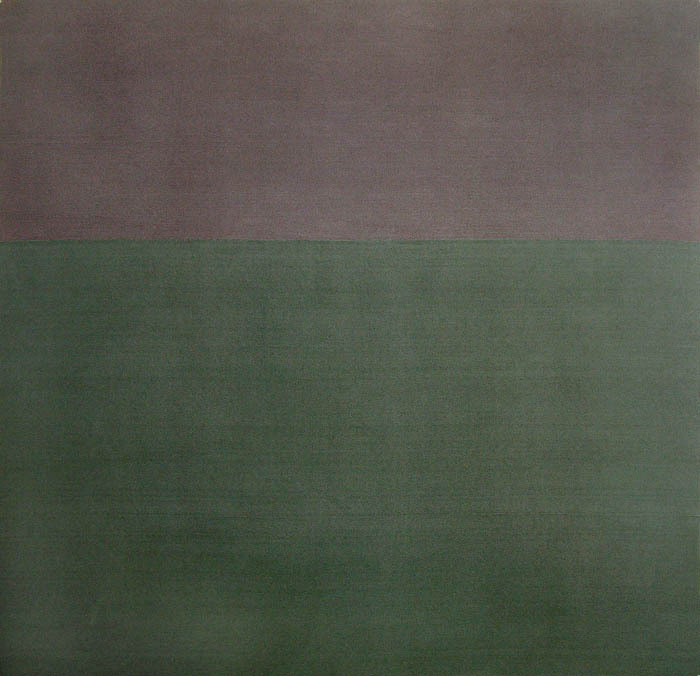 By carefully choosing and balancing colors in stretched cotton, such as Untitled above, he created surprisingly beautiful works. 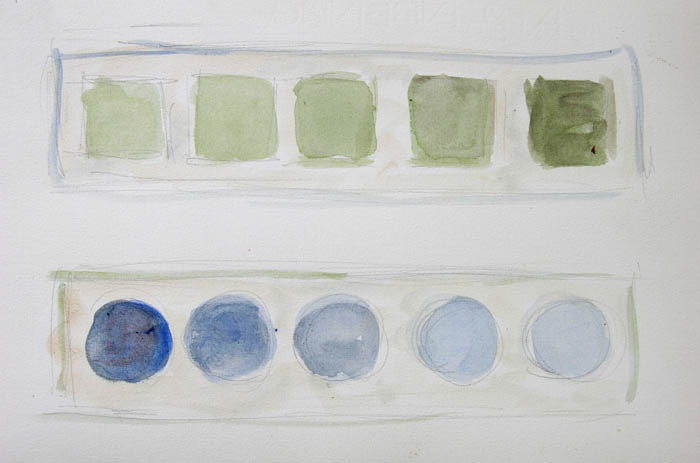 I saw a couple in this series at the Museum of Modern Art in 2008, in a fantastic show called Color Chart. The cloth paintings were strong, lively, and very compelling; who needed paint? I loved them. Another aspect of Palermo's work are his architectural interventions, placing shapes and colors within rooms and hallways, or on the exterior of buildings. 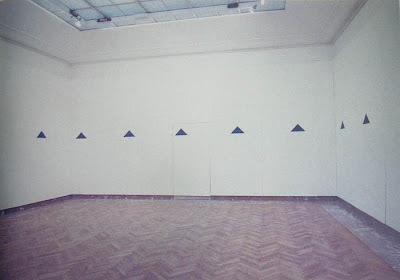 The blue triangle is a particularly vivid example of his wall drawings, which transform a space and become a part of it. 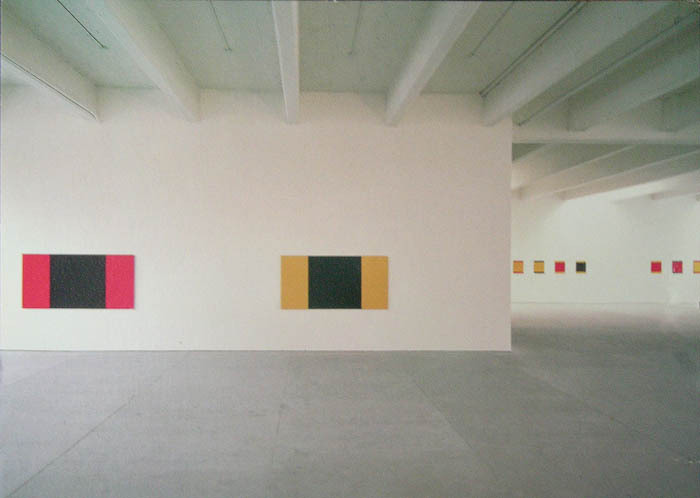 With the simplest of means, 3 colors––red, yellow and black--and rectangles of different sizes––Palermo fashioned a visual feast in which your eye goes dancing from one group of paintings to another, colors repeating yet different, as in a musical theme with variations. 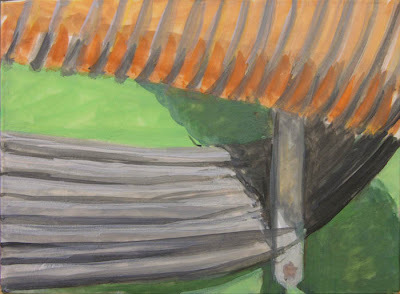 I saw To the People of New York City installed at Dia Beacon and found it exhilarating; it was a new way to think of painting: as a non-linear narrative, an abstract story encompassing time and space. The two ruglets above are tributes to Blinky Palermo. 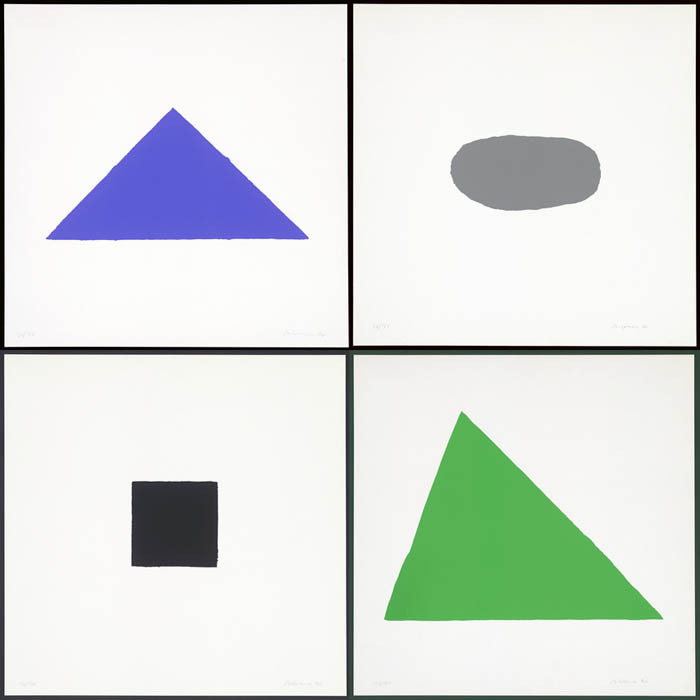 In ah, Blinky I am of course referencing his Blue Triangles works, with one of my triangles 'yearning' towards the other, a geometric form not quite right, as in Palermo's 4 Prototypes. With To the People of Groton, Vermont, which is the town I live in, I chose organic shapes and colors that seemed appropriate for the story of a rural Vermont village, a very modest effort of 4 panels. There are many ideas in Palermo's short career, and I'm sure I'll be returning to them again. 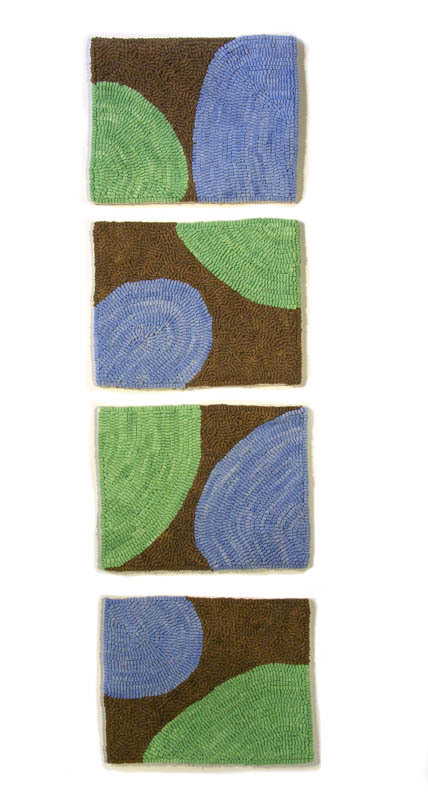 *This post is another in a series of homages to contemporary artists who've inspired my hooked rug work; previous posts included salutes to Mary Heilman, Ellsworth Kelly, Kazimir Malevich, Richard Tuttle, and anonymous Tantra artists. I was inspired by this post at the wonderful blog Each Little World to take a close look at the spores of the many ferns that I see growing in the woods and around my house. 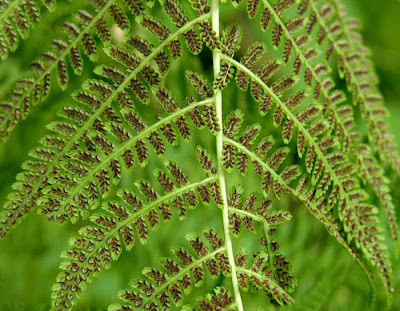 Ferns reproduce differently from flowering plants which create seeds when male pollen fertilizes the female cell, forming a seed with all its genetic material. Ferns are more complicated, with the spores growing into tiny plantlet called a gametophyte, which is fertilized if the conditions are right, with plenty of moisture. This website has a clear explanation of the process. My detective work continued, with the discovery of ferns that had a separate stem for the spores (at least that's what I think it is). 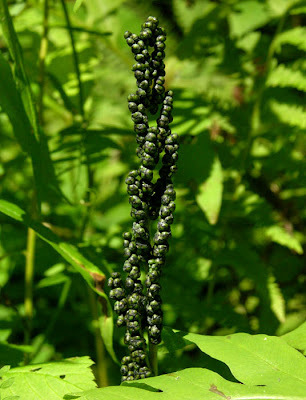 I've seen these called "fertile fronds", this one looking like a row of shiny black beads. 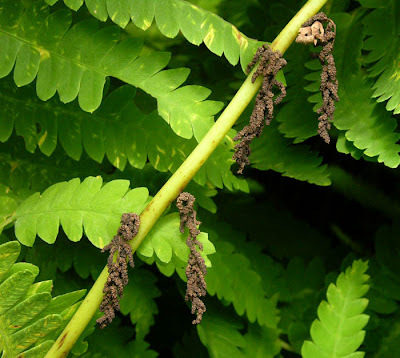 And below is a large fern, growing along my stone wall in full sun, that has its spores dangling from the stems of the fronds. 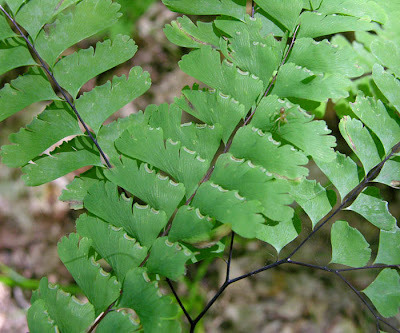 I enjoyed finding a greater variety in the structure of ferns than I had imagined. A New Painting: "Green Orange Black"
With this painting, I am back to an expression of volumetric forms, with the swing of a line of black hoses balanced by the curve, in the opposite direction, of the orange and black hose. Because of the level of detail of the image, it took quite a while to get right. To me, it's important that the detail be convincing enough so that it does not demand attention, but simply feels a part of the whole. I took a couple of photographs of the beginning stages of the painting, in order to show how loose the handling is at first. Even though I trace the composition from a photo, I do not attempt to follow careful outlines; I am more interested in getting a sense of color and value, keeping my eye on the overall effect of light. In this later stage, you can see the image coming into focus. I work on drawing all the curving lines with grace and an illusion of volume. I use a ruler to help with measurements such as the distances between the black ridges on the orange hose, and a T-square, for drawing straight lines parallel to the edges of the panel. All this work is in service of a painting that I hope feels real, with an almost tangible presence. In a recent post, I gathered some quotes from writers on their reasons for writing; in some ways substantially different from the motivations of visual artists, but at their core there's a similarity. I've been rereading The Periodic Table by Primo Levi, a marvelous amalgam of memoir, fiction, scientific inquiry and philosophical musings. Levi lived through the unimaginable: the triumph of Fascism in Italy and internment at Auschwitz. In the chapter titled "Chromium" he tells of how falling in love with the woman who will become his wife reawakened him to life; he then goes on to describe what writing means to him. I found this passage very moving. My very writing became a different adventure, no longer the dolorous itinerary of a convalescent, no longer a begging for compassion and friendly faces, but a lucid building, which now was no longer solitary: the work of a chemist who weighs and divides, measures and judges on the basis of assured proofs, and strives to answer questions. Alongside the liberating relief of the veteran who tells his story, I now felt in the writing a complex, intense and new pleasure, similar to that I felt as a student when penetrating the solemn order of differential calculus. It was exalting to search and find, or create, the right word, that is, commensurate, concise, and strong; to dredge up events from my memory and describe them with the greatest rigor and the least clutter. Paradoxically, my baggage of atrocious memories became a wealth, a seed; it seemed to me that, by writing, I was growing like a plant. 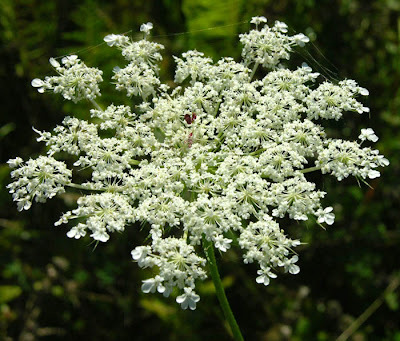 I've long loved this wildflower, with its legend of a queen pricking her finger, her drop of blood forever at the center of the pinwheel of tiny white florets. It has a nice light scent and is pretty in a vase. Thanks to my recent penchant for carrying my camera on my walks to help in more careful observations, I have seen another beautiful stage in the life of this flower: its setting seed. As the flower ages, it begins to curl in on itself, finally forming a round basket of little stems and bracts, an elegant package. 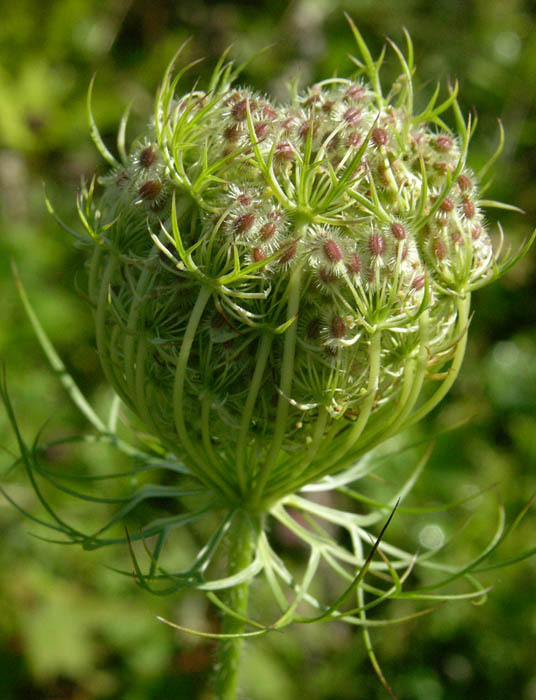 The more mature seeds, fringed by delicate hairs, turn a reddish color, singing out from the greens of the basket. There is such variety and ingenuity in the world of plants. 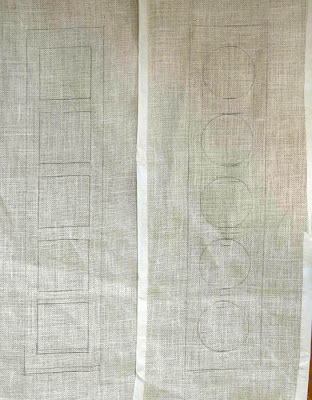 For my next rug hooking project I am going back to geometry, using a thumbnail sketch I'd made some months ago of two long rectangles filled with circles and squares. I played around with the number of elements in each piece and settled on five, which gave the composition enough length––I wanted it to have an element of repetition––without seeming to run on needlessly. I toyed with having a thin line of color for a border, as you can see in the sketch above, but abandoned the idea because I thought it would constrain the image. 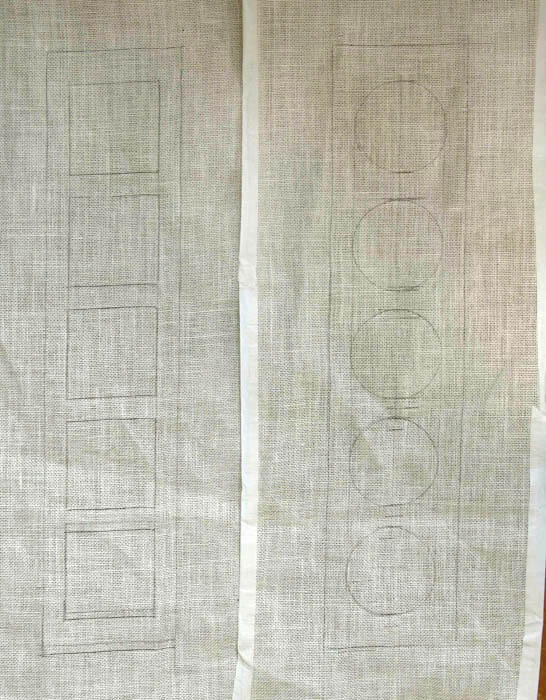 Above you can see the designs drawn out on the linen backing; each panel will be 6 by 27 inches. I have shown them vertically, with the horizontal sketch, because I envisage this pair as flexible in their hanging; I also see them as architectural, as fitting above windows or alongside a doorway. The background color for this diptych is a pale yellow color, and the squares and circles have graduated values. 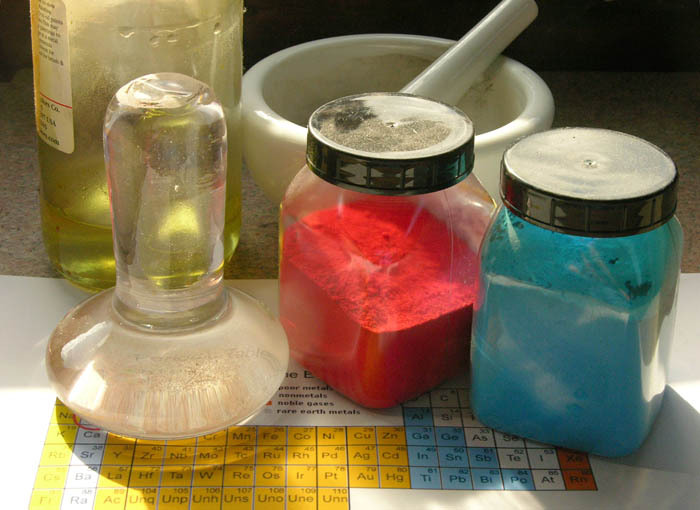 I dyed the blue and the green by mixing up a dye color and then adding it to a small pot: first 1 teaspoon of color for the lightest value, 2 for the second, on up to five for the darkest value. I also added a touch of the background yellow to the lightest value, a bit of red to the darkest (and a touch of blue to the darkest green). I put the dye in the pot, added the small piece of wool to be dyed, and left it in the couple of minutes it took to take up the color. Then I put the dyed piece to boil in another pot, which had vinegar in it, to set the dye. When I'm dyeing larger pieces I dye and set the color in the same pot. 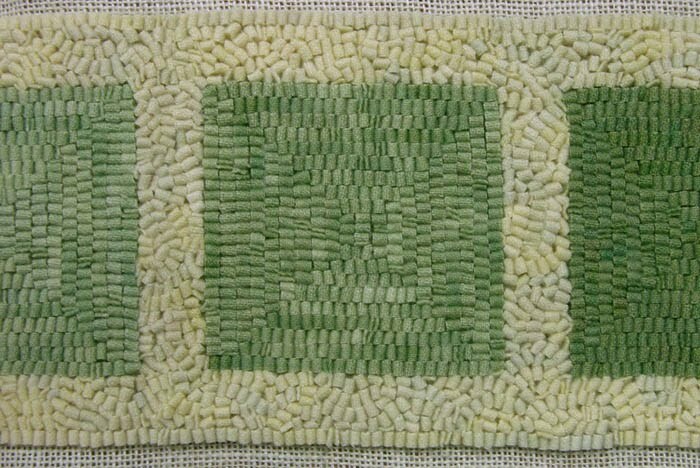 Last night, as I was working on the green squares with their background, I realized that I wouldn't have enough of the pale yellow wool; it rarely happens that I miscalculate this way. 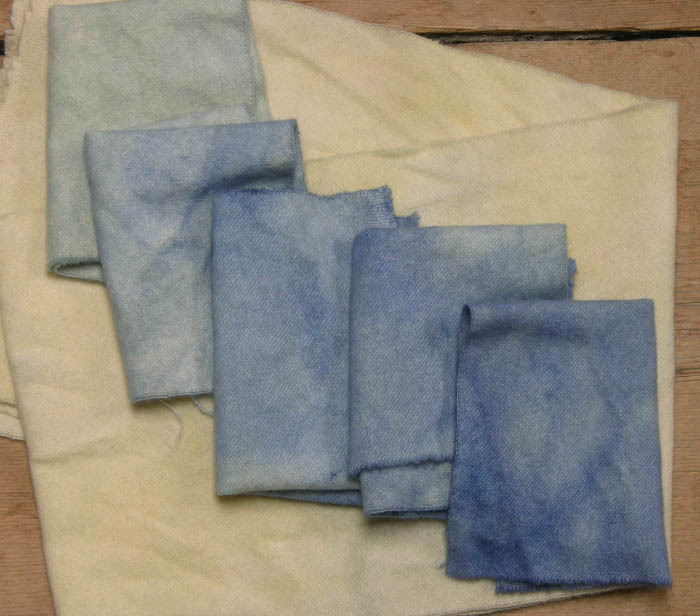 So, this morning I will dye another piece of wool, trying to get it as close in color as possible. I don't use any formulas when I dye wool, as many rug hookers do, preferring to just add a bit of this and that as I see the color evolve, so getting the exact color will not be easy; I will soak a piece of the dyed wool in water so I can better compare the newly dyed fabric. The main challenge is to keep it light at first: you can always add more dye, but once it's too dark, that's it, you have to start over. 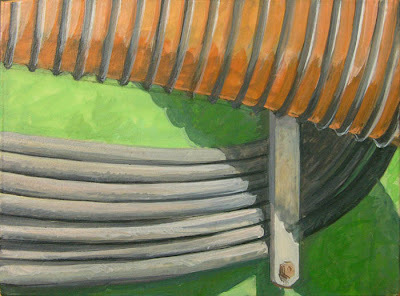 It's all part of the uncertainties and surprises of the art making process. 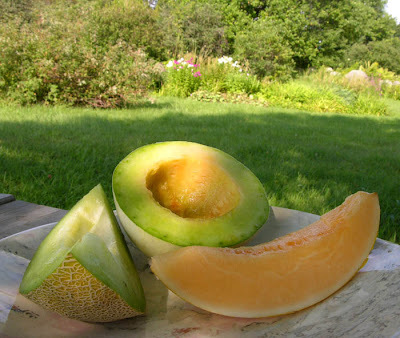 What is more deliciously summery than a slice of melon, cool and sweet and juicy? (leaving out tomatoes, corn, berries...) And what can be more special than picking them from your own garden, where they achieve a flavor, even in the challenging climate of northern Vermont, unmatched by store bought fruit. I grow varieties that are recommended for the north, buying the seed from Fedco, a terrific company in Maine. Their product descriptions are extensive and honest: if they say something is luscious, you can believe them. I've grown Sweetie #6 for many years, but it is no longer available, so I'm using up the remainder of my seed. It's a small fragrant melon with green and orange flesh, and it produces like gangbusters; it even ripens in cool summers. I'm growing both Orange Honey and Arava for the first time, and I'm loving them both. 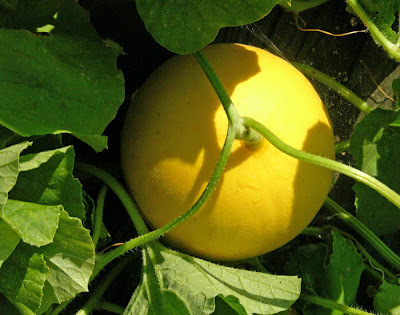 I had forgotten that Arava, a Galia type melon from Israel, was green fleshed, so when I opened it this afternoon I was quite startled; the outside of the melon looks like an ordinary cantaloupe. 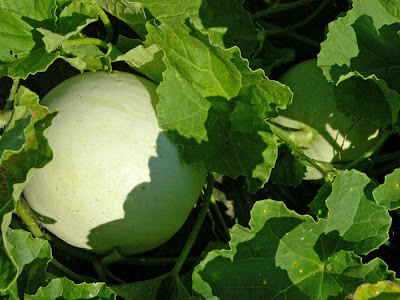 The thing with melons, and with all gardening for that matter, is that you never know if all the work will pay off, if you will achieve "the fruit of your labors". 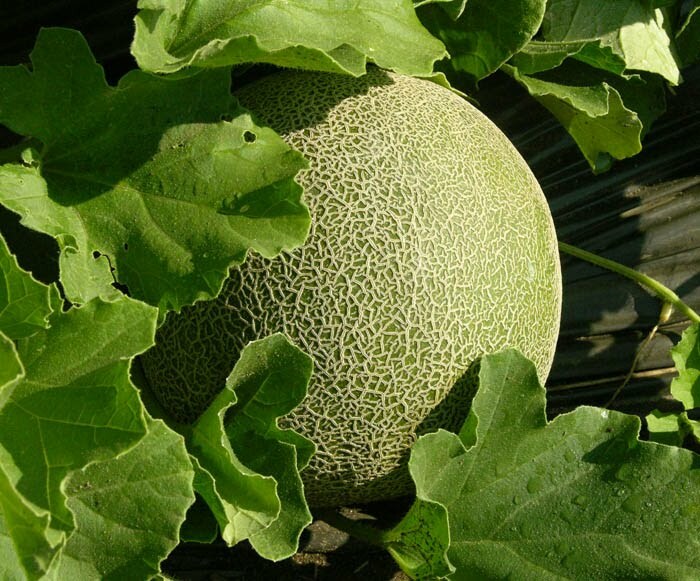 You may only get one ripe melon per plant, or none, but the eating pleasure is worth the chance, and the effort. Despite its prickly presence, I am especially fond of the form of the thistle. There is drama in the spiky leaves and stem; the spines of the bracts look as if they grow in the spiral of the Golden Section (which I wrote about here); the vase shape is topped by the burst of the reddish violet flower head, with crowded thin petals (are these called petals?) soft, yet echoing the spines below. 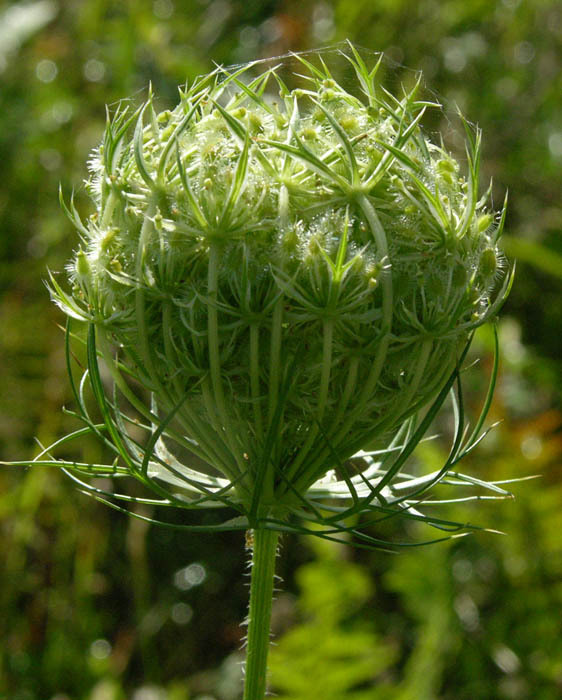 This is a plant that seems to have been designed by an architect, or someone else of similar orderly sensibility. The clarity of form continues with the seeds, which flow out of the dried flower head. 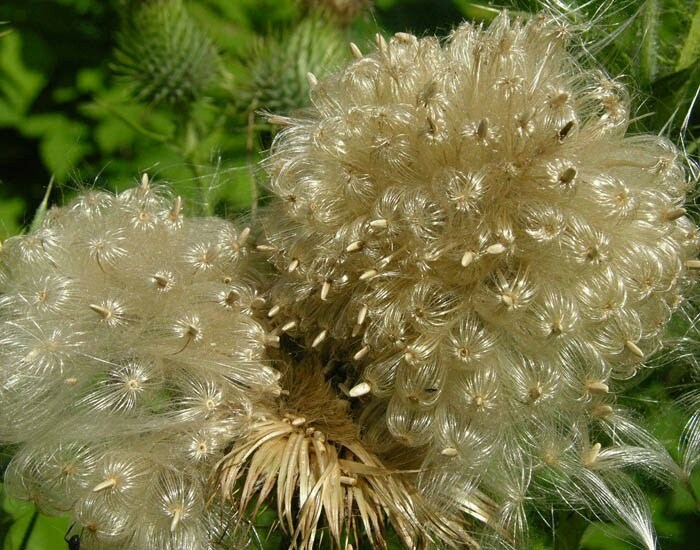 I had never noticed these seeds before; they are really beautiful, each little seed attached to a cup of golden silk, the whole looking like a grandiose hairdo. The way the silk is gathered at the seed reminds me of the seeds of the milkweed, which you can see here. 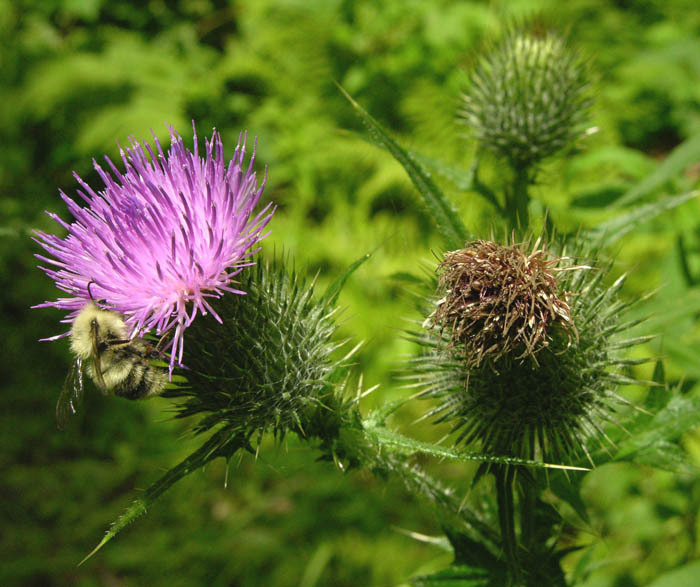 I love the flower head of this thistle-like plant, with its marvelous color change from pink to purple to white. 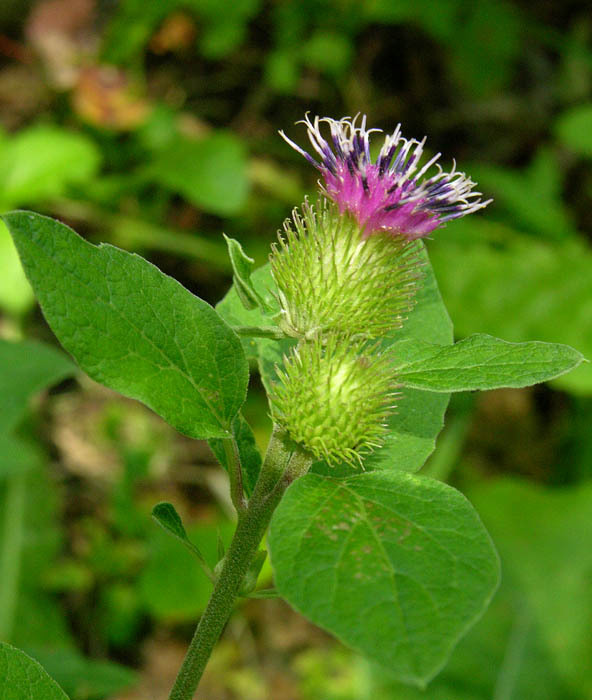 The spiny bracts have little incurving hooks on their ends , adding a bit of whimsy. These are atop what now seem ordinary––leaves, rather than spikes and spines––the whole making an interesting story of contrasts.